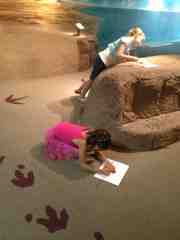 Last Thursday was a long, but wonderful day full of kid-centric activities. 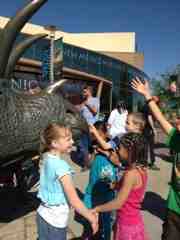 It began with a field trip to the New Mexico Museum of Natural History with Ahava and all of her second grade friends. Although I had planned to work today as I am trying to get two big projects finished before the end of the school year (in four days! 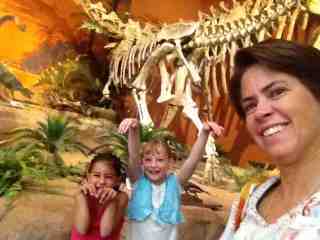 ), after giving it some thought I realized field trips with my kids are few and far between so I decided to tag along. I got assigned to hang out with Ahava and one other little girl; both of whom were relatively easy to keep track of. 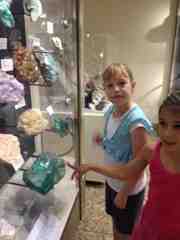 I honestly think it was the best visit I have ever had to this museum. That was probably because I didn't have to drag a wiggley two-year-old or an afraid-of-fire-and-scary-creatures 6-year-old around with us (which apparently were both everywhere in the Prehistoric Age... the fire and scary creatures, not 2 and 6 year olds). Generally I don't enjoy spending the day looking at stuffed dead animals as many natural history museums would have us do, but this museum had fascinating displays on fossils, petrified wood, dinosaurs and other ancient artifacts which I thoroughly enjoyed. 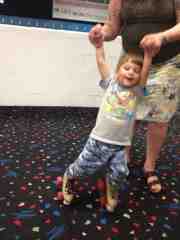 It seemed Ahava had a great time too. And because she is at an age where she understands the informational placards there was actually some solid learning going on. After the trip to the museum we began the typical afternoon shuffle with Ahava at gymnastics, Ziva at tennis and Samuel trying to escape in every way possible. That boy seriously wears me out! Such a good thing he is so cute, otherwise I would spend my days being frustrated instead of cracking up at all his antics! 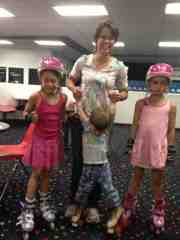 The final activity today was a school fundraiser at Roller Skate city in Albuquerque. It was impossible for me to skate with Samuel to wrangle but I did have fun talking to some of the other parents and watching all the wobbly kids and teachers make their way around the rink. 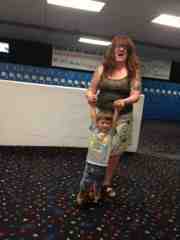 But by far the highlight of the night was watching Samuel trying to roller skate for the first time! He was like a cross between a king-fu fighter on wheels and a pile of jello. My friend, Mita was laughing so hard I thought she might cry. Like I said, Samuel is very entertaining! The take-away from a day like this is that I really like hanging out with my kids. I knew that already, of course, but sometimes the rigors and requirements of parenting take the fun out of it. Now that I have shifted toward being more present in the moment I am starting to see my overall enjoyment of my kids increase too. Win-win for us all!